The Broda Pedal Chair is ergonomically designed to encourage self-mobility. 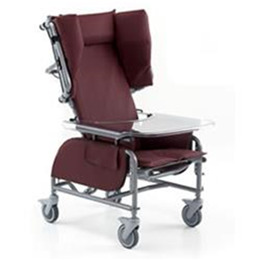 It’s an excellent option for residents who can self propel within a facility and allows a proper foot on floor position. The Pedal Chair is a comfortable, safe, and stable alternative to an indoor wheelchair. Residents who are self-mobile, but lack strength and stability. Residents requiring light to medium levels of care. The floor to seat height adjustment accommodates both short and tall residents, adjusting from 12.5" to 17.5".